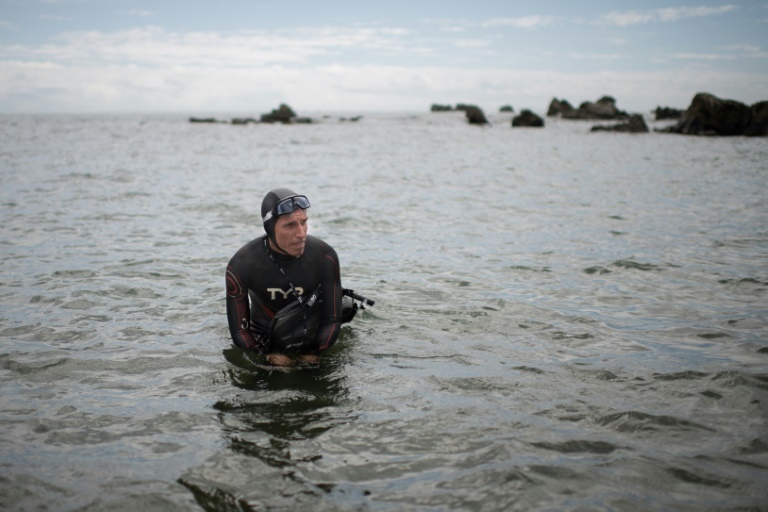 Ben Lecomte dived into the Pacific Ocean Tuesday, kicking off an epic quest to swim 9,000 kilometres (5,600 miles) from Tokyo to San Francisco, through shark-infested waters choking with plastic waste. Under sunny skies, the 51-year-old Frenchman slipped into cool and placid waters shortly after 0900 (0000 GMT), in warm and pleasant conditions with a slight breeze. He will face giant waves, sharks and jellyfish, and will also swim through part of the “Great Pacific Garbage Patch” in his attempt to be the first to accomplish the feat of swimming across the world’s biggest ocean. “I’m very anxious to start right now,” said the swimmer as he prepared to take to the waves. His son and daughter swam with him for the first hundred metres or so, then rejoined a crowd of around 70 well-wishers, with family and friends hugging each other on the shore. “It’s very emotional for a lot of people here,” said Lecomte. Part adventurer, part environmentalist, Lecomte hopes to raise awareness of plastic contamination and ocean pollution and his support team will conduct a raft of experiments on the trip, expected to take between six to eight months. Part of his daunting swim takes him through the Texas-sized vortex of garbage that floats between Hawaii and California, where tangled plastic will pose extra dangers. His team will collect water samples to learn more about the build-up of micro-plastics littering the area. He will be accompanied throughout by the 20-metre (67-foot) support boat Discoverer, where he will eat, rest and sleep before being dropped every morning where he stopped the previous evening. In an interview with AFP just before he began his Odyssey, Lecomte revealed the mind tricks that keep him going through the physical torture of eight hours of ocean swimming per day. “The mental part is much more important than the physical. You have to make sure you always think about something positive or you always have something to think about. “When you don’t have anything to occupy your mind, it goes into kind of a spiral, and that’s when trouble starts,” he said. He said the hardest part was getting back into the chilly water every morning and admitted that he would hit a “wall” after around four to six hours every day. Lecomte swam across the Atlantic in 1998, vowing “never again” after finishing, but he was inspired to get back into the water after starting a family. “When I was little and I was with my father walking on the beach, I didn’t see any plastic or hardly any. “Now every time I go with my kids, we see plastic everywhere,” added Lecomte, who will also wear a device to test levels of radioactive material from the tsunami-hit Fukushima nuclear plant.